Brunei Darussalam Energy and Trade Minister Awang Haji Mohammad Yasmin Bin Haji Umar takes a ‘twofie’ with Gov. Edgar Chatto in this file photo at the Governor’s Mansion during the Asian energy forum in August. Brunei Darussalam’s energy minister also reputed to be the most senior and trusted minister of the oil-rich nation’s king, is definitely coming back to this island-province that seems to charm him endlessly. Minister of Energy and Industry Awang Haji Mohammad Yasmin Bin Haji Umar will likely bring along with him fellow ministry officials and personnel to Bohol where they can also conduct their government conference. He may even have his family, too, in an extended Bohol stay for leisure and pleasure. “I will come back to Bohol again this year,” Umar wrote to Gov. Edgar Chatto more than a month after the key Brunei official attended the 34-country Asian energy forum in Panglao early in August. 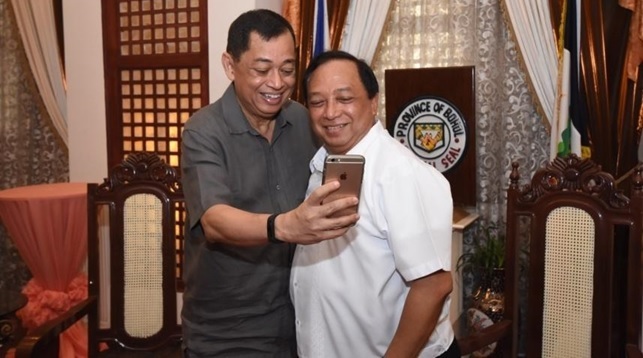 “Bohol’s Asian energy meeting hosting helps broaden our levels of relation and capacity in the face of globalization, for us to be both a global citizen and a global community without losing our local essence,” Chatto said. Umar prominently spoke during the Asia Cooperation Dialogue (ACD) Conference on Energy, notably at its associated meeting dubbed the 1st East Asia Energy Forum, in Panglao last month. Just last week, Bohol again hosted an important Association of Southeast Asian Nations (ASEAN) meeting, this time on maritime transport. Earlier in April, the province hosted the Inter-Sessional ASEAN Caucus Meeting of the Regional Comprehensive Economic Partnership Trade Negotiating Committee. Umar is the most senior and trusted minister of King Hassanal Bolkiah of Brunei, which economy is kept afloat by the nation’s rich oil industry. Known as the Sultan of Brunei, Bolkiah is among the wealthiest men on earth, owning, among others, luxurious cars like 530 Mercedes Benzes, 500 Roll Royces, and 360 Ferraris. Brunei is the second smallest Southeast Asian nation, next only to Singapore, but because of its strong economy that depends on oil, also called the black gold, its citizens enjoy free public health system, among others. But for Umar, the contagious Boholano hospitality showed to him and the rest of the Asian forum delegates was as engaging as a gold. Also in his letter to the governor, the minister mentioned two female “gracious staff, Geraldine and Katrina,” who were the protocol ladies assigned to him in Bohol during the Asian meeting. The two are among the province’s young and talented 73 hospitality and protocol officers trained at the Foreign Service Institute of the Department Foreign Affairs. It members coming from the government, private sector and tourism industry itself, the hospitality and protocol corpse is led by Liza Flores of the Special Projects Unit of the Governor’s Office. The group handles the province’s MICE or Meetings, Incentives, Conventions, and Exhibitions. Not just the Brunei minister, other delegates to the Asian and ASEAN conferences in Bohol did promise to return as tourists together with their families, even friends who may be interested in investing in Bohol. 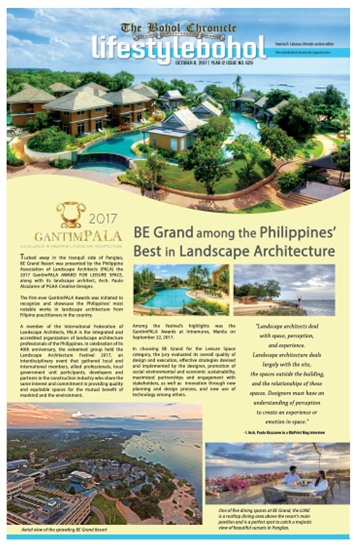 Their return any time of their choice is expected, especially once the Panglao Bohol airport is operational starting in August next year. Tugade was accompanied by Chatto to the new airport site where the secretary himself assessed the progress of the construction works. On the following day, National Economic and Development Authority (NEDA) Sec. Ernesto Pernia, also together with the governor, visited the project area. The country’s first and only “green airport” of international standard is projected to level the playing field for Bohol to emerge strong on the economic development and growth map of Central Visayas. In his letter, Umar mentioned Chatto’s thoughtfulness for which character of the Bohol leader the province has become more endeared to the minister of Brunei. According to a member of the province’s protocol team, the governor had formally conveyed his sympathy and prayer to Umar as soon as Chatto learned of the death of the minister’s father last month. The minister’s father died days after the official had returned to his country from Bohol. “We take comfort in knowing we have your support at this difficult time and that my beloved father is in your thoughts,” the minister said in his letter to the governor.